Good morning beautiful people, I hope that your week is going well. Yesterday I got my 3rd tattoo (pictured below), all of my tattoos are encouraging to me. This one was inspired by the Christian band For King and Country’s movement (link to a video with them explaining at the bottom of this paragraph), Their movement is to remind every girl that they deserve to be treated with respect and honor, to remind every guy to treat girl’s with that respect and honor, and to remind everyone that no matter what you have done, you are priceless. They have a song and movie both with that title. You may have noticed that in the title the “i” is replaced with a “;” some of you may know why, some of you may think that I’m just an idiot. But the reason is because of something called the semicolon movement, a semicolon is used when the author could have ended the story, but chose to keep going. The movement is based on the same thing, but replace author with a person. It is a symbol for someone who has chosen to keep going even when they thought about ending it all (it can also be in support of somebody who chose to keep going). If you’ve read my blog with my story from a few weeks ago, then you know that I chose (and still am choosing) to keep going with my story. The “L” in my tattoo is a purple & teal ribbon which stands for sexual abuse (teal) & domestic abuse (purple) survivor (again if you want to know more about why that is important to me go checkout my blog “This is my story, this is my song, praising my saviour all the day long” from a few weeks ago). Please choose to keep going, please remember that the Lord has a plan (Jeremiah 29:11 “For I know the plans I have for you”, declares the Lord, “plans to prosper you and not to harm you, plans to give you hope and a future.”), he is the author of our stories but we have to choose to keep going. Whatever you’re going through it will get better. I know it feels like it won’t, I know that sometimes it feels that ending everything is the only way out, but it’s not. I believe things will get better, even if it’s only for a season and they get bad again…that’s life and with The Lord by your side you can do it. You’ll want to be there for the happy times, for the love and the laughter, for your friends and family, for the sunsets, the ice cream, and puppies (or whatever makes you happy). 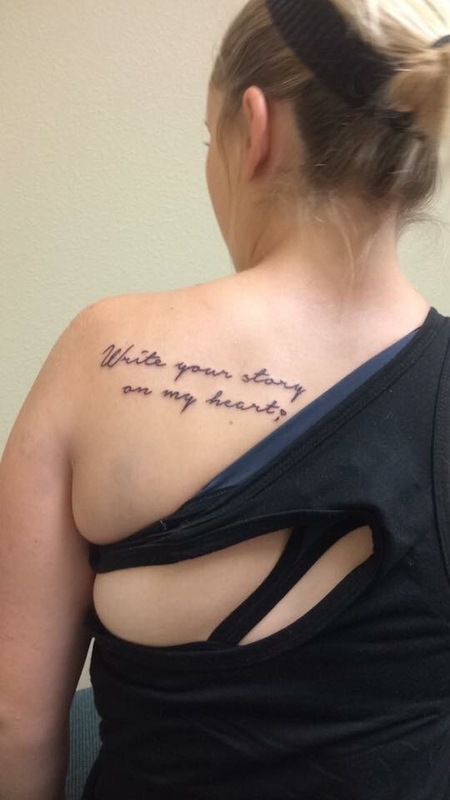 Last June I got my second tattoo (pictured below) which is a quote from Francesca Battistelli’s song “Write Your Story” I got it asking the Lord to write His story on my heart and surrendering in order to let him. I let go of my plans (or at least tried and am continuing to do so), knowing that the Lord’s were so much better than I could ever dream. 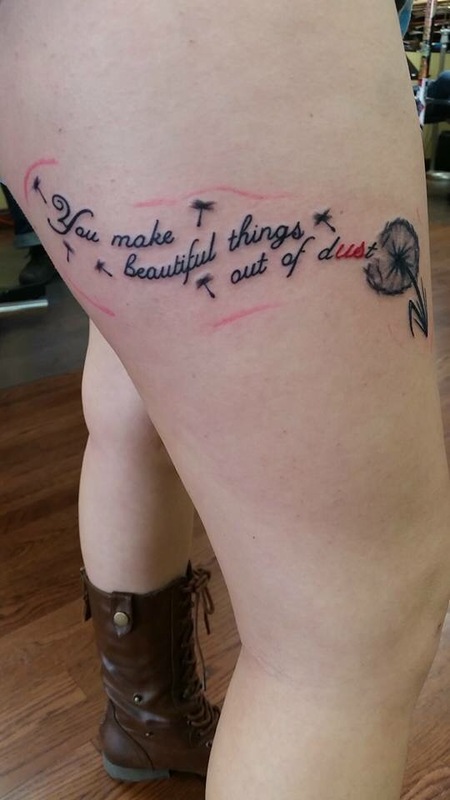 A year and a half ago I got my first tattoo (pictured below) which are lyrics from Gungor’s song “Beautiful Things” “You make beautiful things, You make beautiful things out of the dust, You make beautiful things, You make beautiful things out of us.” The Lord makes beautiful things out of our brokenness, so keep going and let him. You are priceless no matter what you have done, no matter what you do, no matter what people tell you, no matter what you see when you look in the mirror, no matter what you hear when you lay down at night. 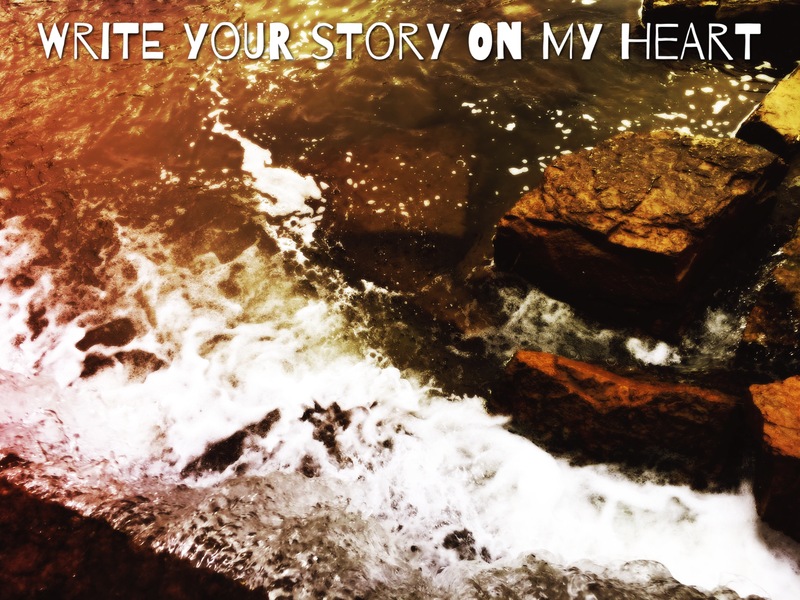 The Lord died for you, he came for you, he loves you, and he has a plan for you. 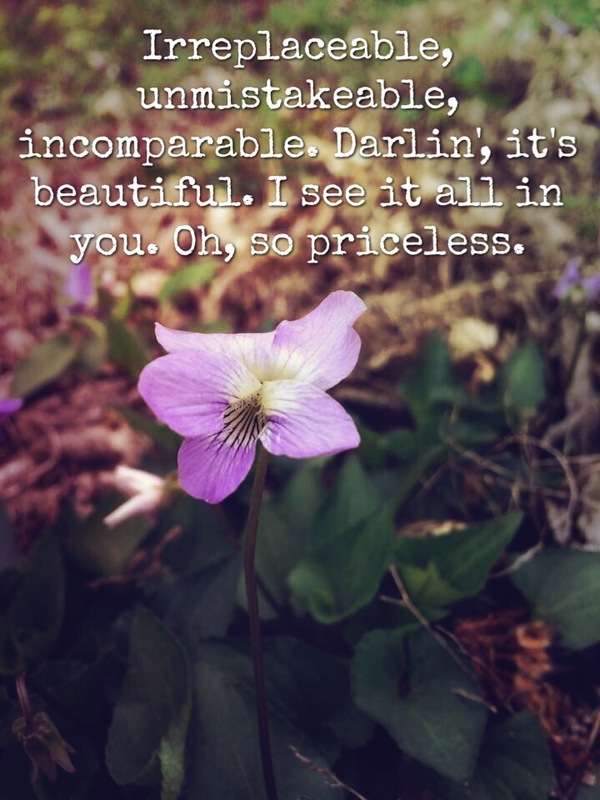 You are irreplaceable, unmistakable, incomparable and oh, so priceless. This entry was posted in Christian and tagged for king and country, Francesca Battistelli, Gungor, Priceless, Semicolon movement. Bookmark the permalink.